Save money on your next maintenance service or auto repair. Please note that we can only honor coupons presented prior to service. I’m beyond blessed for Deerfield Auto Repair. My family and I have been going for regular maintenance and oil changes for years, but today my check engine light came on and the indicator said there was an emissions problem. The great mechanics hooked my car up, ran some diagnostics and what could have turned into several thousands of dollars worth of work ended up only being a system update that was needed. Joe quickly updated the computers in my car and I was back on the road. I am confident in the work that was done and couldn’t be more pleased with the professionalism, honesty and courteous staff at Deerfield Auto Repair. I have visited Deerfield Automotive repair for my automotive needs going on 15 years. Recently I acquired a 2000 Mercedez Benz S500 that had numerous issues with the air suspension system. Difficult to diagnose and satisfy a cost effective solution. Joe suggested removing the computer controlled air suspension system with a traditional suspension system saving me thousands of dollars in replacement cost. The new suspension system performs very well. Another good repair job by Deerfield! Hats off to Joe and his staff of mechanics! I highly recommend Deerfield for your repair needs. He has worked on my 2000 Ford Ranger, my three Impalas (2004, 2008 and 2014), 2014 Toyota Tacoma and my Mercedes. Does not matter what make or model or year of your vehicle. 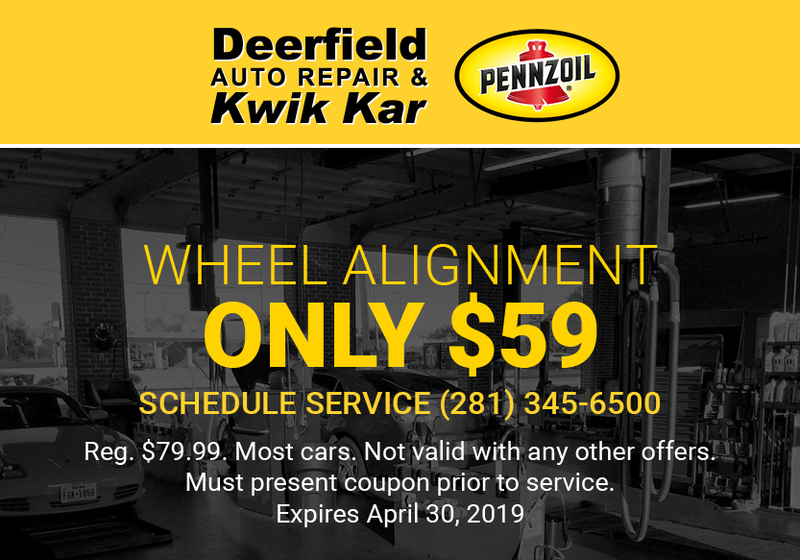 Joe and his team at Deerfield will service your vehicle with expertise and skill and also provide the greatest of customer care and service. Right (near) on the corner of Clay road and Barker Cypress under the Kwik Kar banner is Deerfield. I recommend them for all your automotive mechanical needs. Today, I went to have my vehicle serviced with an oil change. I have enjoyed my experience with these folks since they 1st opened 16 years ago. I have had my service done on 8 different vehicles during this time. So, why do I keep going back. Well they are honest, friendly and very good at what they do. I have never had an issue. Unlike other oil change companies, they never apply pressure when they recommend a service is due. They make you aware and will be happy to provide that service. Today, it is consumer beware. 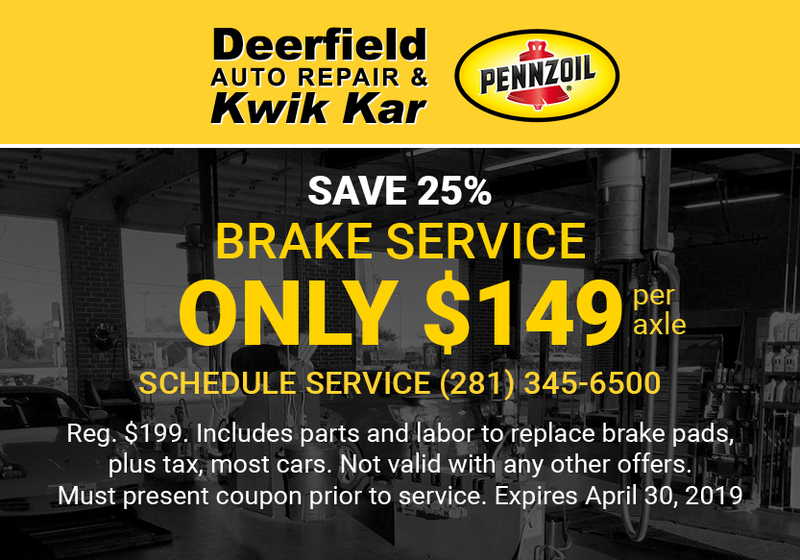 With Deerfield Auto Repair and Kwik Kar, the only thing to know is that you will be taken care of with no worries. I highly suggest that the next time you need service, go to them. You will be happy that you did. I was recently introduced to this Auto Repair shop by a friend whose recommendation I trusted. It's never easy to figure out where to take a vehicle for repairs and the shop I used to go to went out of business. Today is the 3rd time I've taken a car there in the last few months and they are excellent! Mike is so great to work with, I just call and he is very helpful and service minded. I feel very confident that the work is competent and that the prices are fair. This is the only place my friend who made the recommendation takes his cars and I am now a loyal customer as well. 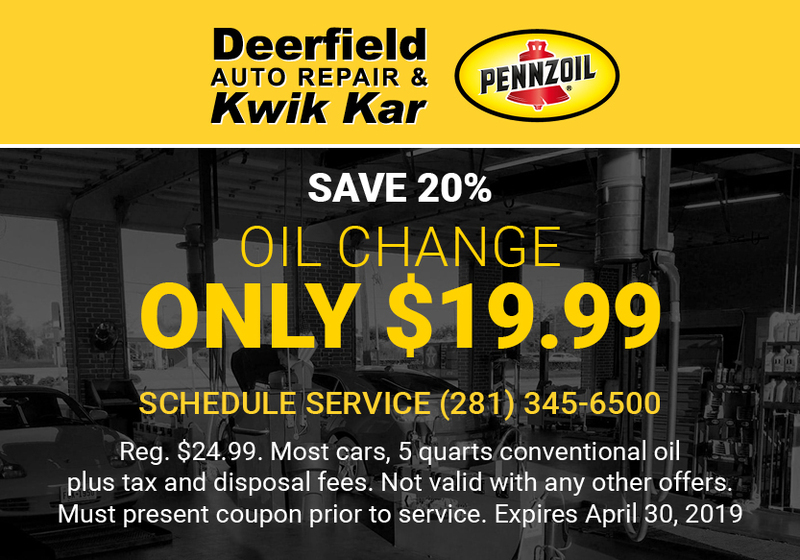 I am also recommending Deerfield Auto Repair and Kwik Kar to all of my friends! I have been going to Deerfield Auto Repair for many years, more than 12. I have ALWAYS been impressed with the owner's sincerity and focus on customer service. Yes, sometime auto repairs cost a lot of money, but Joe Fallon and his staff always explain exactly why the repair is needed. I have never suspected them of doing anything other than what was needed. I will continue to go to them. They have been my families go to service for all our cars and trucks since they open 16 years ago. I have recommend them to anyone that ask about a good and fair priced auto repair and service. I now live about 200 miles away from their location , but when I'm in town and my car needs service this is my first and only stop to get it done. The owner Joseph and his crew were amazing and quick! My car needed a few services & now the ride feels so smooth, I’m so damn happy! So worth it. Thank u guys so much!! Great service. Joe the owner is very attentive to customers. Fast service and great prices. I highly recommend them if you want great and quick service. Reasonable prices and professional service! Joseph went above and beyond to help me when I really needed it! He’s a great guy. I highly recommend! Great place for auto repairs or just your basic oil change. Joe, the owner, is always courteous and friendly and I trust him with my car. If you need any work done on your car I highly suggest bringing it here. Been going to see these guys for a long time now. Good quality work with fair pricing. Joseph Fallin really cares about taking care of you and your vehicle. I bring all my non-warranty work here and have had no complaints what so ever. Strongly recommend them to my friends and coworkers.